DVT or deep vein thrombosis is a blood clot that develops, usually in the legs. Blood clots impede blood from flowing back to the heart, they can be dangerous if part of it breaks loose and travels to the lungs, where it blocks one or more arteries in the lungs. Approximately 1 in 1000 people will develop DVT in their lifetime. There are 3 main factors to consider when DVT is in question. Venous stasis (stagnant/sluggish flow), hypercoagulability (thick blood), and damage to the lining of the blood vessel wall (trauma, surgery). These 3 factors are collectively called Virchow’s triad, named after a German pathologist Rudolf Virchow. Various medical conditions put you more at risk for developing a blood clot; they include but are not limited to, recent surgery, pregnancy, cancer, and trauma. Signs of a DVT include swelling of the leg, pain, and redness. Many people don’t show any signs or symptoms. Ultrasound is the gold standard for diagnosis of DVT. Using real time imaging, the deep veins are evaluated, flow is assessed using Doppler, and a diagnosis is made. Ultrasound is inexpensive, relatively painless, portable, and does not use ionizing radiation. Ultrasound has dramatically improved the diagnosis, treatment, and outcome of DVT. Compression socks help people who are at risk of DVT, they help with the return of blood flow to the heart. Walking and being active also help prevent DVT because exercise uses the muscles of the legs to help force blood back to the heart and keep it circulating. This is why medical professionals want patients up and moving as soon as possible after surgery, this way the blood does not stay stagnant in the veins, increasing the risk of clotting. 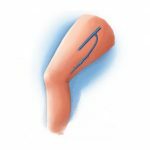 The most common treatment of DVT is anticoagulation therapy and the use of compression socks. In some cases, thrombolysis is the best treatment option. This is where the radiologist accesses the vein, and mechanically removes the clot. For high risk patients, or patients with multiple episodes of DVT, there is also the option of an IVC filter, basically a filter that is put in the inferior vena cava, the vein that returns blood to the heart in the abdomen. This filter will catch any clots that come loose, and this prevents pulmonary embolism.